The protests of young environmentalists against the construction of kiosks in a central Yerevan park have been going on for nearly two months now. A “senior” group of protesters joined the young campaigners on March 31 – among them some well-known figures in Armenia. The group tried to dismantle the already installed pavilions, but the police cordoned off the constructions and would not let them get closer to them. 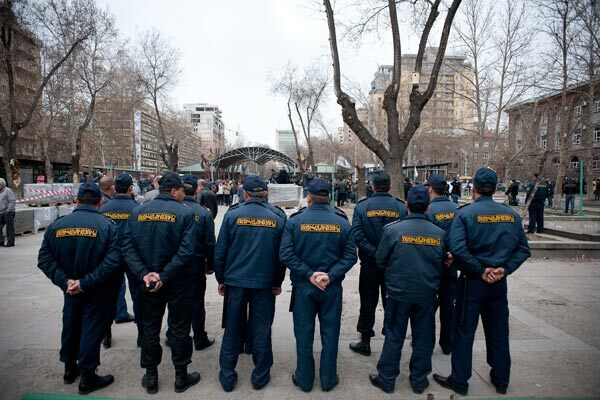 Despite the lack of success the action in Mashtots Park has already been dubbed as unprecedented. Among the group armed with all the necessary tools were the director of the Armenian Center for National and International Studies (ACNIS) Manvel Sargsyan, well-known filmmaker Tigran Khzmalyan, Lragir newspaper editor Haikazn Ghahriyan, and others. They spent the night in the park, while on April 1 they were replaced by another “shift”, also including well-known scholars and public figures. In online social networking sites the group has already been dubbed a “Dismantling Brigade” that is building a new society, while experts say that the fate of the Armenian oligarchy is being decided in Mashtots Park. Both the public and the government understand this, and the authorities seem to be unwilling to retreat. Turning to the police, ACNIS Director Sargsyan urged them not to protect the “illegally erected” buildings. No one, even the government, already denies that these shops are illegal, he stressed. More than a dozen pavilions were transferred to the park after the Mayor’s Office ordered their dismantling from the sidewalk of another major Yerevan street, Abovyan. Prime Minister Tigran Sargsyan said that the pavilions would be in Mashtots Park on a temporary basis and would be dismantled in three years’ time when the Old Yerevan project was to start. However, members of the “Dismantling Brigade” stated that the kiosks must go now, as there are no guarantees that it will be done later. As representatives of the community of Yerevan, to which the park belongs, the environmental activists require the documents on the basis of which the kiosks have been installed in the area. However, the legal aspect of the matter remains vague. On March 31, the police pledged to provide within three days the documental basis, but it is already clear that it will turn into “a legal special case”. The names of the owners of the shops are not known either, even though the names of well-known figures, including ex-mayor of Yerevan Gagik Beglaryan, are mentioned in the media. The Dismantling Brigade and young activists vowed to stage an open-ended strike until the municipal authorities dismantled the shops. The newspaper Hraparak on Saturday reported information that the Mayor’s Office was negotiating with the owners of the kiosks about their removal to another location. However, observers believe for the city authorities, which defend the interests of private property to the detriment of municipal green space, as many say, it has become a matter of principle, and they are unlikely to give up. The voice of civil society in Armenia is now being raised more frequently and more loudly, and against the backdrop of the electoral process it becomes obvious that the situation has changed, the civil movement is developing separately from the political process and one day may become prevalent.